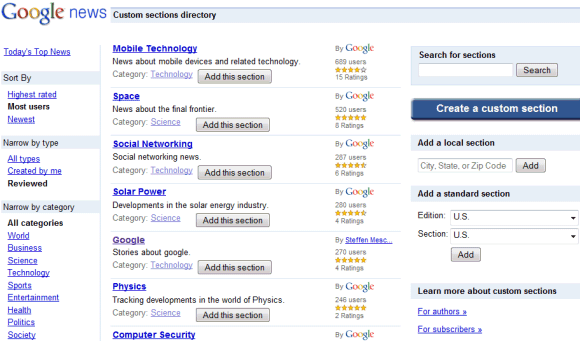 Google News added a directory for custom sections and an easy way to create your own custom sections. 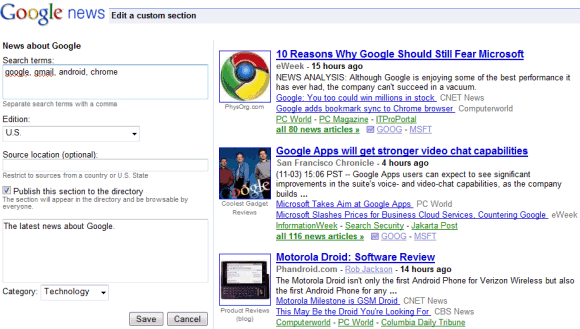 Until now, the only way to add a section to Google News was to perform a search and click on "create custom section" at the bottom of the search results page. Now you can click on "Add a section", find your favorite sections or create new ones. Google doesn't offer too many options when you create a section: type a list of keywords, restrict the results to a national edition or to the sources from a certain location. For example, you can create a section for Google-related news by entering [google, gmail, chrome, android] or any other combination of keywords related to Google. You could also create a section about web browsers by entering [browser, chrome, safari, opera browser, firefox, internet explorer]. "Personalized News enables you to get news tailored specifically to your interests. You can personalize your own Google News homepage by creating Custom Sections from your favorite searches and mixing and matching existing standard sections from the regional and language editions of Google News. After defining your Custom Section, you have the option to "Publish this section to the directory" by checking the box provided. This will add your Custom Section to the Custom Section Directory, where other users can add it to their Personalized News page, as well as rate your section," explains Google. I noticed this new feature last night, I like it. I created 3 news searches, one for news of my native country, one for local news, and the other for a baseball player I'm a fan of. I'm still not a big fan of Google News when it comes to local news because it doesn't display a diverse coverage of news from local news outlets, but it's improving (I think).